Fox, insula Australiana, habetur locus maximae Megachiropterorum coloniae in continente. Megachiropterum in Hortis Zoologicis Singaporanis. Megachiroptera sunt subordo mammalium ordinis Chiropterorum et eius sola familia, Pteropodidae. Quae animalia volantia in regionibus tropicis subtropicisque Eurasiae, Africae, Oceaniae reperiuntur. Chiropteris insectivoris maiora sunt, atque echolocatione non navigant, nonnullis generibus exceptis. Herbivora sunt, qui ad cibum inveniendum visu odoratuque innituntur. 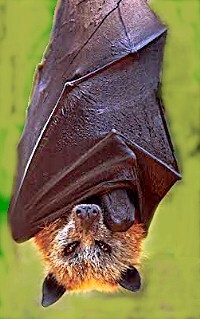 ↑ Kenneth Cody Luzynski, Emily Margaret Sluzas, et Megan Marie Wallen, Pteropodidae: Old World fruit bats. Animal Diversity Web, University of Michigan. ↑ Smith, Charles H.. "PTEROPODIDAE(FruitBats/Flying Foxes)". MAMMFAUN. Western Kentucky University (includes range map). ↑ Gerhard Neuweiler, The Biology of Bats (Oxoniae: Oxford University Press, 2000), ISBN 978-0-19-509950-8, accessum 28 Martii 2015. Leroy, E. M., B/ Kumulungui, X. Pourrut, P. Rouquet, A. Hassanin, P. Yaba, A. Délicat, J. T. Paweska, J. P. Gonzalez, et R. Swanepoel. 2005. Fruit bats as reservoirs of Ebola virus. Nature 438(7068): 575–76. PMID 16319873.l doi:10.1038/438575a. Bibcode 2005Natur.438..575L. Myers, P. 2001. Pteropodidae. Animal Diversity Web. html. Accessum 26 Decembris 2006. Raabe, Emily. 2003. Flying foxes. Novi Eboraci: PowerKids Press. ISBN 0823963241. Teeling, E. C., M. S. Springer, O. Madsen, P. Bates, S. J. O'Brien, et W. J. Murphy. 2005. A molecular phylogeny for bats illuminates biogeography and the fossil record. Science 307(5709): 580–84. PMID 15681385. doi:10.1126/science.1105113. Bibcode 2005Sci...307..580T. Criticism of the molecular evidence for bat monophyly.